Like all pest control companies in the state of Georgia, Mr. Pest Control is regulated by the Georgia Department of Agriculture. What does this mean to you? It means that the Georgia Department of Agriculture maintains a standard of how materials can be applied to insure that everyone, including the technician are safe. Mr. Pest Control and the Georgia Department of Agriculture do not want harmful materials into creeks,streams and rivers. Many of the materials used by Mr. Pest Control are Green materials. Mr. Pest Control believes that using Green materials as well as other materials approved by the Georgia Department of Agriculture are the best methods to create a barrier around you home or business. We believe that quality should never be compromised especially when it comes to your home and safety of your family. 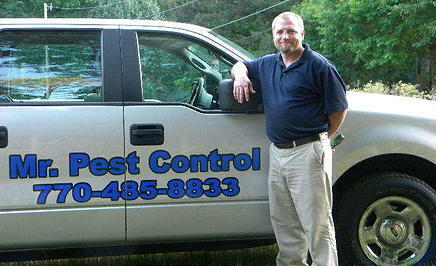 When Mr. Pest Control applys materials, we do so outside the home with inside on request. This "Outside the Home" approach allows Mr. Pest Control to keep most of the materials outside of the home and only use materials inside the home when it is needed. This approach minimizes unnecessary exposure to non-pests and reduces pests resistance to the materials.